It can be hard to stay on track spending money wisely when you’re under pressure from midterms and finals. As we know from our grasp on financial literacy, building and sticking to a budget is critical to a successful economic future. If you can stick to your budget under the stress of finals and midterms, you’ll be prepared to face future challenges in life with a level head. Let’s look at why sticking to a budget is so important during crunch time and check out some tips on how to stay on track when classes get tough. Sticking to a budget means being aware of your income and spending levels and maintaining a balance between them. High-pressure situations like challenging course tests can cause us to neglect our financial plan and overspend on things like late-night takeout and before class coffee. You can avoid excess spending by sticking to a budget. You are fostering a habit that will benefit you for your entire life when you set a spending goal and stick to it. Good financial skills are crucial in today’s world and can be what makes your financial future bright. Put in writing a list of your income, expenses and spending goals. 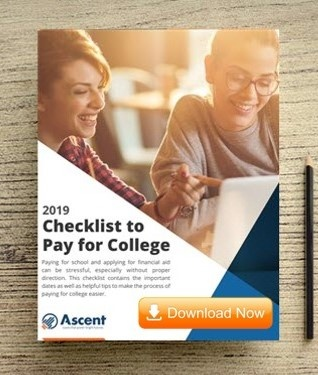 Use our helpful Ascent-College Student Budget Calculator to help you organize your budget and calculate your total income and expenses automatically. Your written budget should include a timeline that lists due dates of upcoming expenses or incoming funds. Set aside some extra cash during the year to put toward a ‘Finals Budget,’ which will serve as a type of low-level emergency fund that buffers you against those crunch-time expenses that may arise. Consider adding some extra savings to put toward upcoming midterms and finals weeks—you’ll thank yourself later! Budget your time, not only your money. You’ll avoid becoming overwhelmed when the time comes to take the test or pay the bill. Get a good grasp of how you can best allocate your time by planning your study and break hours ahead of time. By allowing yourself some time to think about and plan your budget, you’ll be better prepared to stick to it when times get tough. Avoid burnout by making time for yourself. This means getting the rest you need, eating well and getting some exercise. Take time to stretch and take frequent, short breaks during study sessions. If you’re well rested, you’ll be less likely to make mistakes and forget due dates. Remember that a good night’s sleep is critical to retaining information from the past day’s studies. Remember the big picture by reminding yourself of what you’re working toward and how each small step has its place in the path to your financial future. 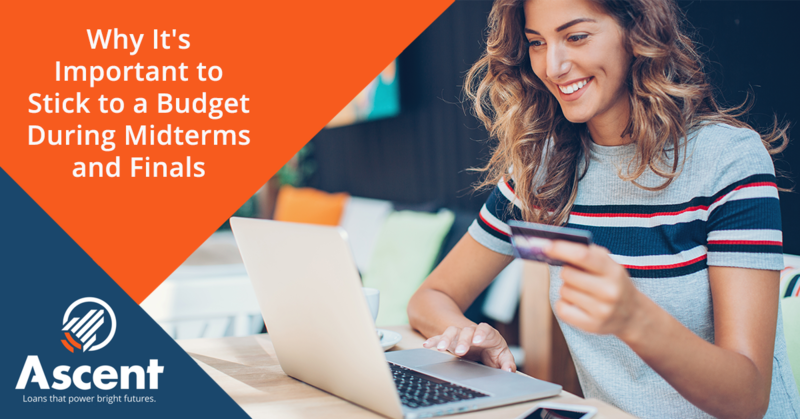 Giving into short-term temptations (like buying coffee daily from that cute barista on campus) may be hard to resist when you’re under stress, but by remembering your long-term goals you can establish your confidence in sticking to a budget. Take a breath, take a step back and stay on track! The pressure of finals and midterms make reaching out for help from friends, family or financial services a wise choice during this time. Look for offers from your school aimed at easing the stress of finals week—even restaurants in your school’s food court may give deals. Remember, if you’re feeling overwhelmed, there are always support services at your school that can help you. Don’t be afraid of reaching out for help when you need it. There are several resources to help you master your college finances, including helpful articles you can find in our blog section. Be sure to check back often to find the latest and greatest budgeting tips. At Ascent, we are determined to help students stay on track with their educational, professional and financial goals. Stay in touch with Ascent to explore all of the helpful resources available to you. Whatever your goals are, Ascent strives to help you make them a reality. Previous To Transfer or Not to Transfer?